Waitangi Treaty Grounds historic precinct is part of the Tentative list of New Zealand in order to qualify for inclusion in the World Heritage List. The signing of the Treaty of Waitangi in 1840 is presented as THE significant event in the creation of the New Zealand as it exists today - that country’s “founding document”! In recent years the Treaty has undergone something of a “resurrection” in NZ after a long period of being ignored or, at best, “honoured” in theory as the moral basis for colonialisation and an example of how race relations should be conducted in colonial situations. More recently it has been the means through which NZ has tried to address the residual problems of its relationship with the Maori people. Despite its issues of interpretation and legal uncertainties it is generally promoted as having been a “good thing” even to the extent of making its day of signing a National Holiday. As such it is hardly surprising that the location where it happened is something of a “national shrine” for New Zealanders. But us that enough to make it suitable as a WHS? And is it worth visiting anyway if you are a non-New Zealander? There are very few WHS sites inscribed primarily because of what happened there – and, where there are, they tend to be of “World significance – e.g Hiroshima and Auschwitz. Also, the WH Convention requires that there be tangible remains with OUV rather than merely a metaphysical link to the event – however important. Leaving aside whether the signing of the treaty was a “world significant” event, what are the “tangible remains” of the event? 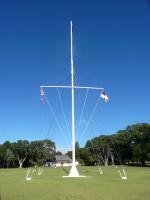 Well there is a replica flag staff in approximately the original position in the open grassy area where the events took place (photo). There is a 35 metre long Maori canoe (Waka) built in 1940 whose boat house is just outside the “Historic Precinct” (but would presumably be inscribed anyway although “movable” heritage can’t be considered for WHS status). There is a Maori meeting house also built in 1940 to celebrate the centenary of the Treaty. This functions as a Maori “national marae” to be shared by all Maori tribes. And finally there is the “Treaty House” – the British Residency. This had been built as early as 1833/4 and was the location for early meetings but the full discussions with the assembled tribes took place in a tent in front of this house. The house itself was altered in the 1840s and heavily restored in 1932 after falling into disrepair. Inside, the interior wall of one room has been cleared of plaster etc to reveal an original exterior wall. The site is pleasantly situated on a rise overlooking the Bay of Islands and stretches down towards the beach where the Maori canoe is housed. Beyond the cleared areas there is “virgin” New Zealand bush. The area around is well worth visiting if you are in Northland but I can’t say I was impressed with the site itself. The first negative was the entry fee – a whopping NZ$25 pp (over 15 Euro!!) but FREE to New Zealand residents. You would think that NZ would want to show off its National shrine to overseas visitors or at least wouldn’t discriminate against them! But in fact it seems that overseas visitors actually have to subsidise New Zealanders! A problem is that the site is owned and run by the private “Waitangi Trust”. And what do you get for your money? Well there is a new Visitor Centre in a nice building. It shows a rather ordinary audio visual but otherwise is primarily a souvenir shop. There is then a “Rainforest” walkway through the bush and up to the grounds and the buildings. You are then able to enter the meeting house and meet a couple of Maoris in national costume and finally you can visit the “Treaty House” itself. It is a pleasant little period house and garden but rather underwhelming in the great scheme of things. Now there is a public path around the grounds along the “cliff top” – so, if you just want to see the grounds, flagstaff and buildings from the outside, take in the Canoe and miss the Visitor Centre you can easily do so for free! I might say that I like NZ and would recommend it as a destination so, go up to Bay of Islands by all means but the Treaty Grounds can easily be missed out at these rip-off prices! And what about the WHS credentials of the site – well, as implied above I just can’t see the case.